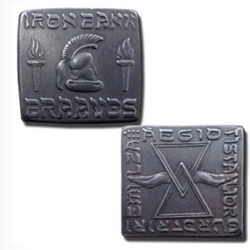 The dominant small-coin of the Braavosi currency system is the Braavosi Iron Square. The hands of the Iron Bank of Braavos are always out, with the hourglass keeping the time till they come to get what’s due. The Iron Bank is a major player in the events of A Song of Ice and Fire. The Iron Bank is richer and more powerful than all banks in the Free Cities combined, and has a fearsome reputation when collecting debts. Finished to appear circulated, this officially licensed coin is struck in the U.S.
translated- "The Iron Bank will have its due"